This week (storm permitting), I’ll be off to Fort Worth Texas to participate in the National Art Educators Association’s (NAEA) national conference. 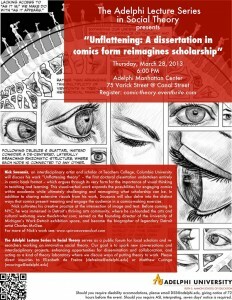 On Thursday March 7, I’m part of a panel talking comics, education, and research that stemmed from the special issue of the Journal of Visual Arts Research devoted to comics. My piece “The Shape of Our Thoughts” (which along with a link to the others can be found here) has been an important component of my theorizing on how comics do what they do, and I’m in the midst of reworking it and expanding upon those thoughts for Chapter Three of the dissertation. The opening sequence on the confining nature of languages and comics amphibious nature is here. New pages are almost done – i’ll post next week. And coming up in a few weeks, I’m delighted to be presenting on my dissertation and comics as a new form of scholarship at Adelphi University’s Manhattan campus. It’s the kickoff talk for an ongoing lecture series in Social Theory at Adelphi. 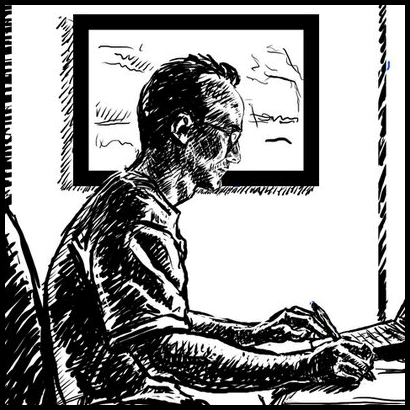 In addition to sharing work from the dissertation and exploring distinct ways that comics can present meaning – I also plan to engage attendees in a comics-making exercise or two.